For seasoned RNs who are tired of the physical and emotional drain of bedside nursing and long hours at the hospital, becoming a Clinical Coordinator at a travel nursing company may be an ideal career move. Clinical Coordinators still use their nursing skills and education — only now they’re in an office environment with a team of staffing professionals. Deb Bacurin, RN said she took the job of Clinical Coordinator to improve her quality of life and spend more time with family and friends. She says her new job as a clinical staffing advisor brings her a lot of satisfaction. It was also a perfect opportunity to put an end to the stress and strain of floor nursing. For more information regarding Clinical Coordinator positions, check out this clinical coordinator bio. Previous Previous post: RNs throughout the Midwest Will Love Ste. Genevieve, Missouri! Next Next post: Are Telemetry Nurses in Demand? Like the cartoon! 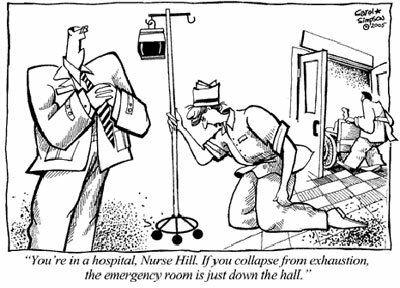 You know what they say about nursing: Pays better than the fast food biz, but the hours aren’t as good.